Three things distinguish granite from other types of stone. First, granite is made of large mineral grains (which is where its name came from) that fit tightly together. Second, granite always consists of the minerals quartz and feldspar, with or without a wide variety of other minerals (accessory minerals). The quartz and feldspar generally give granite a light color, ranging from pinkish to white. That light background color is punctuated by the darker accessory minerals. Therefore classic granite has a “salt-and-pepper” look. The most common accessory minerals are the black mica biotite and the black amphibole hornblende. Third, almost all granite is igneous (it solidified from a magma) and plutonic (it did so in a large, deeply buried body or pluton). The random arrangement of grains in granite—its lack of fabric—is evidence of its plutonic origin. Rock with the same composition as granite can form through long and intense metamorphism of sedimentary rocks. But that kind of rock has a strong fabric and is usually called granite gneiss. Amateur: With only a little practice, you can easily tell this kind of rock in the field. A light-colored, coarse-grained rock with a random arrangement of minerals—that’s what most of us mean by “granite”. Real Granite: Geologists are professional students of rocks, and what you would call granite they call granitoid. 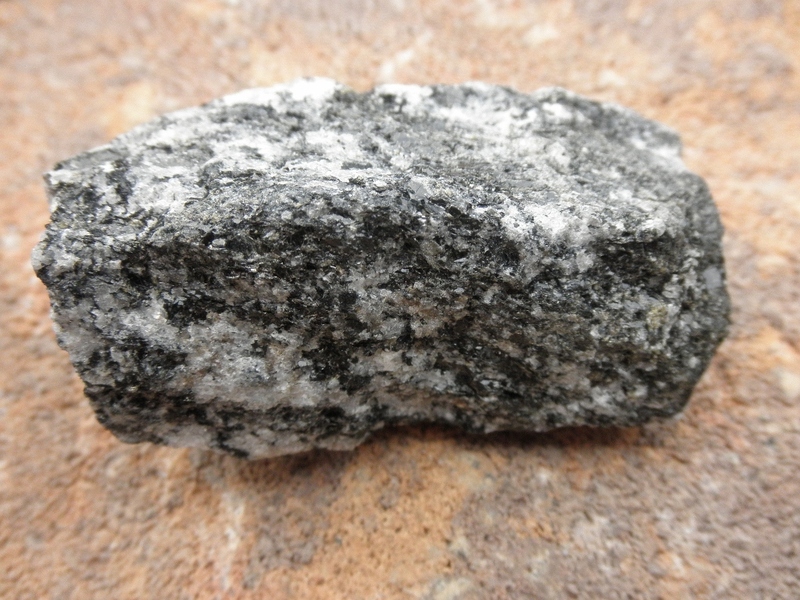 True granite is only one of the granitoids, a granitoid with quartz content between 20 and 60 percent and a feldspar content in which alkali feldspar rather than plagioclase feldspar predominates. Commercial: Stone dealers have a third set of criteria for granite. Granite is a strong stone because its mineral grains have grown tightly together during a very slow cooling period. The quartz and feldspar that compose it are harder than steel, which makes granite desirable for buildings and for ornamental purposes such as gravestones. Granite takes a good polish and resists weathering and acid rain. But stone dealers use “granite” to refer to any rock with big grains and hard minerals. So many types of commercial granite seen in buildings and showrooms don’t match the geologist’s definition. Black gabbro or dark-green peridotite, or streaky gneiss, which even amateurs would never call “granite” in the field, still qualify as commercial granite in a countertop or building. Granite is found in large plutons on the continents, in areas where the Earth’s crust has been deeply eroded. This makes sense, because granite must solidify very slowly at deeply buried locations to make such large mineral grains. Plutons smaller than 100 square kilometers in area are called stocks, and larger ones are called batholiths. Lava erupts all over the Earth, but lava with the same composition as granite (rhyolite) only erupts on the continents. That means that granite must form by the melting of continental rocks. That happens for two reasons: adding heat and adding volatiles (water or carbon dioxide or both). Continents are relatively hot because they contain most of the planet’s uranium and potassium, which heat up their surroundings through radioactive decay. Anywhere that the crust is thickened tends to get hot inside (for instance in the Tibetan Plateau). And the processes of plate tectonics, mainly subduction, can cause basaltic magmas to rise underneath the continents. In addition to heat, these magmas release CO2 and water, which helps rocks of all kinds melt at lower temperatures. It is thought that large amounts of basaltic magma can be plastered to the bottom of a continent in a process called underplating. With the slow release of heat and fluids from that basalt, a large amount of continental crust could turn to granite at the same time. On the grandest scale, granite represents the way the continents maintain themselves. The minerals in granitic rocks break down into clay and sand and are carried to the sea. Plate tectonics returns these materials through seafloor spreading and subduction, sweeping them beneath the edges of the continents. There they are rendered back into feldspar and quartz, ready to rise again to form new granite when and where the conditions are right.